Theodore Tugboat on the move. Of all the boats and ships on the water in Halifax, none stand out more than the brightly coloured Theodore Tugboat. You simply can’t miss this cartoon-like boat, with his giant red cap and smiling face. 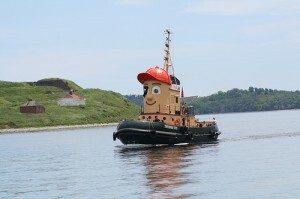 For years, the story of Theodore and his life as a tug in Halifax harbour was the basis for a television series that entertained kids all over North America. The TV show is no longer being made but Theodore still goes out into the harbour and you can hop on board. Tours run several times a day between June and September, even when it’s raining, and last an hour. Theodore leaves from the wharf at Murphy’s on the Water – a large souvenir shop, restaurant and tour company on Lower Water Street, close to the Historic Properties and not far from the Maritime Museum of the Atlantic. Directions: 1751 Lower Water Street, Halifax. Admission fees: Adults $ 19.99, kids 6-15 years old $14.99, 1-5 years old $ 8.99, family of 4 $ 59.99. Add 13% tax to all prices. Tour times: Every day between mid-June and September at 11am, 12:30 pm, 2pm, 3:30pm, 5pm and 6:30pm.